" - learning to understand and cope with the uncertainty and complexity of having a sister with autism and a sensory processing disorder. This heartwarming story is told with such love as the family works together to find ways to be part of each others lives." "This beautifully illustrated, kid friendly picture book, told through the eyes of a sibling, will help children understand others’ sensory difficulties, and explain sensory processing disorder." "Ms. DeMonia knows how to write a good story about these topics while explaining them in a child-friendly way. It provides a new perspective"
"Love For Logan is a wonderfully written and beautifully illustrated book that talks about real life events between two sisters." "Love for Logan, is a wonderful sequel to Leah’s Voice about the same two sisters, Leah and Logan. Logan, the younger of the two, learns from her parents about Leah’s sensory processing disorder. Love for Logan shows the love between the members of this family who try to set things up so that the needs of each one are respected." "Love for Logan is the lovely sequel to Leah’s Voice and is another wonderful addition to my special needs acceptance & awareness library! 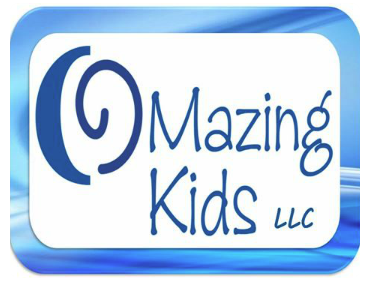 The book gives insight into Sensory Processing Disorder & Autism." 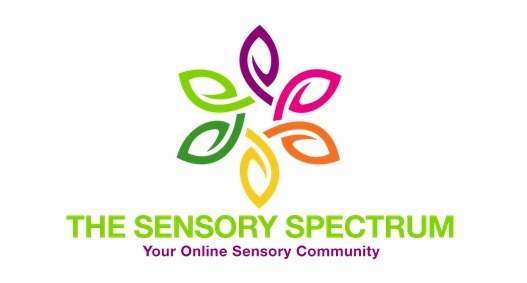 "Leah’s Voice is a wonderful addition to my special needs acceptance & awareness library! I love how the story unfolds, the message of treating everyone with kindness and that it is inspired by the author’s daughters." "This book is simply delightful. It tells a story that children will enjoy, as well as cleverly raining questions that many children would like to ask, and answers them honestly and gently. I give this book a huge thumbs up!" "This book is extremely poignant and what I like about it is that it tells it simply how it is, this book is for children yes, but it does not talk down to children, it explains in an age appropriate manner what autism is." "The story is told with such simplicity that young children will be able to read and understand. Siblings don’t know how to explain it to their friends. They are embarrassed by their behavior and angry when they have meltdowns and ruin family outings. Leah’s Voice is an important story about accepting differences and treating others with respect and kindness. It is perfect for the classroom. Monique Turchan’s illustrations are colorful and lively. They beautifully capture the emotion of the story." “I like children's books that try to tackle difficult subjects, but ultimately they still need to be good children's literature. Lori DeMonia clearly agrees. Her book, Leah's Voice, isn't just a "difficult subject" book. It isn't just about Autism. And her goal isn't just to help kids "cope with" an Autistic sibling." "The story begins when excited sister Logan welcomes her friend Abby, who has come to play, and introduces her to Leah. The girls are playing a board game when Leah leaves the room without a word." "This is a very nice story from the point of view of a girl whose sister has autism. I like that it shows (sadly, in reality) how some kids react to people who act differently. The picture book is simple and the message can be understood by young kids." "This book would be helpful to siblings who have a hard time explaining to their friends that their brother or sister has Autism. 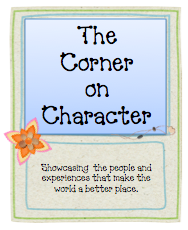 Inclusion and acceptance are two themes showcased in this story." "One of the best ways to teach young children about life is through the use of picture books and stories. When I first started teaching students with autism 4 years ago, I was in shock that I could only find one picture book about autism!" "This week I was lucky enough to receive a digital copy of an adorable book picture book about autism! It's definitely a unique book that takes a whole new perspective. With the world becoming more aware of autism, it's time siblings and other children understand autism too! Leah's Voice is a very sweet story which does exactly that! I've searched high and low for good picture books about autism, and trust me, there aren't many! This one is very lovable for both the heartfelt illustrations and the caring set of characters." "But even more delightful is that I was instantly drawn to the playful and brightly-colored illustrations that enhance this simple story of two siblings who are dancing through life and learning the steps it'll take to successfully navigate life on the spectrum. " 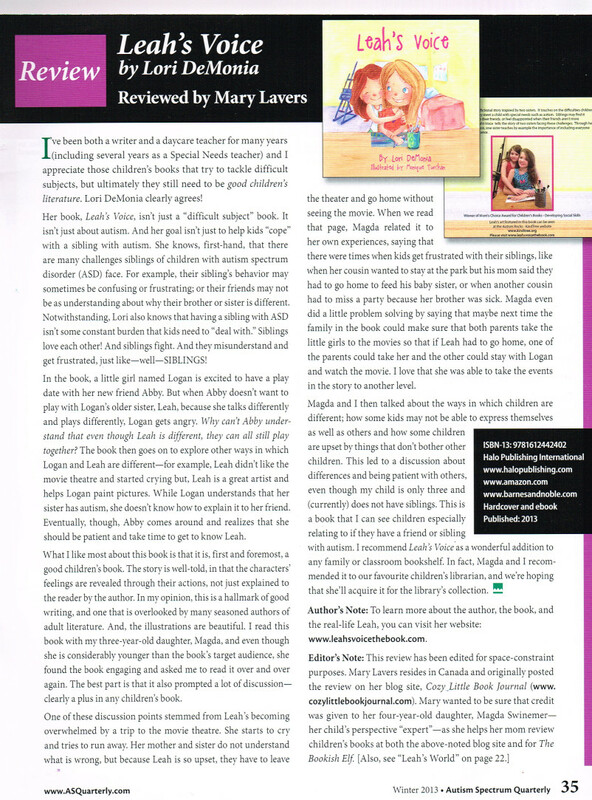 "Congratulations to all the folks behind the absolutely beautiful children’s book, Leah’s Voice by Lori DeMonia! Educators and parents can use Leah’s Voice as a resource for teaching siblings and friends about inclusion and acceptance. The 28 page picture book is about a sibling with autism but its important message on the acceptance of differences and treating everyone with kindness is for all children." "I think the story was realistic and relatable for children. With Autism affecting so many families today, it’s important to have good literature to support teaching our children about the spectrum. 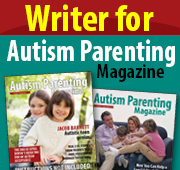 It’s not just a book for families with children who have autism. Our children will have friends at school on the spectrum. The book is good to bring awareness to all." "What I like most about this book is that it is, first and foremost, a good children's book. The story is well-told, the characters' feelings are revealed through their actions not just stated by the author (a hallmark of good writing, in my opinion, and one that is overlooked by many seasoned authors of adult literature) and the illustrations are beautiful."